Studies demonstrate that music education dramatically increases early brain development and improves overall academic performance. 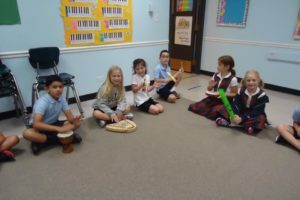 The SJS music classroom is one that has an atmosphere of experiential learning based on the fundamentals of music with hands-on activities that include singing, playing instruments and moving to and creating music. There are two concerts per year – one at Christmas time and VIP Day in the spring. Primary Music emphasizes practice with gross motor skills, such as galloping, hopping and dancing. Intermediate Music focuses on the study of musicals, an in-house talent show and a unit in improvisational theatre. Grade 8 students learn six to eight ballroom dances in Music Class, leading up to a Gr. 8 Valentine’s Dance in February. Each year St Joseph School performs two Christmas Concerts – a daytime and an evening performance. The performance concludes with a Live Nativity presented by the Third Grade class and the entire school returns to sing the closing song along with the audience. The VIP Show is held in May with all of St. Joseph students participating. Each year the musical show centers around a certain theme. Performances are held during the school day for the Very Important People in our students’ lives. 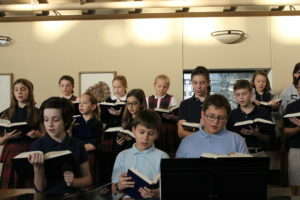 The St. Joseph School Choir is open to SJS students in grades 4 through 8. 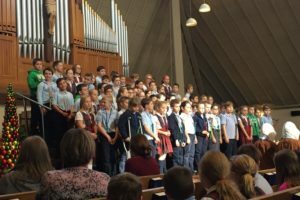 They perform at school liturgies on Tuesdays, and selected holidays during the school year. Choir rehearsals are held during the school lunch period on Mondays. As part of the St. Joseph School music program there is a Choirchime training choir open to 5th and 6th graders, and the St. Joe Ringers Handbell Choir which is open to experienced ringers in grades 6 through 8. Each of these groups plays several times throughout the year during the school Mass. The St. Joe Ringers play for the annual school Christmas concert and present other programs during the year. Both of these choirs are electives and classes are held once a week during the school day. Handbells and Choirchimes are tools for music reading and understanding as well as for the enjoyment, teamwork, and sense of accomplishment of the ringers. Research has also found that learning to play a musical instrument has a positive influence on other learning skills. Choirchime and Handbell rehearsals are held once a week during the school lunch period on Wednesday, Thursday or Friday. Students in grades 4 through 8 are invited to participate in the St. Joseph school band. Our bands will perform a Christmas concert, spring concert and at several school Masses. Students in Kindergarten through grade 4 may take piano lessons. Lessons are provided by Band for Today.